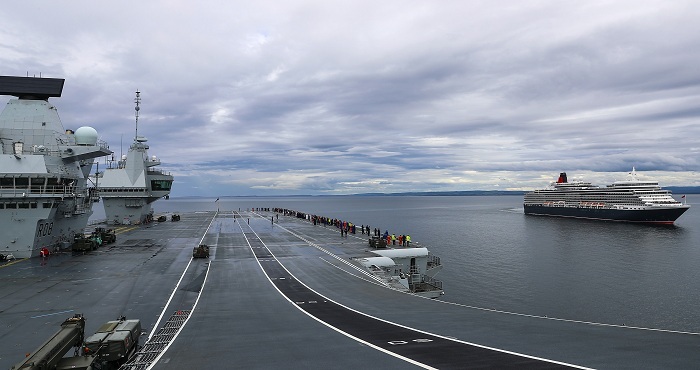 Cunard’s Queen Elizabeth luxury cruise liner met HMS Queen Elizabeth for the first time earlier. The rendezvous of the two ships, that share the same name and who were both christened by The Queen, took place in the Moray Firth off the coast of Scotland during Queen Elizabeth’s 13-night tour of the British Isles. Cunard captain of Queen Elizabeth, Inger Klein Thorhauge, said: “It is a huge honour for myself and the crew of Cunard’s Queen Elizabeth to meet HMS Queen Elizabeth for the first time. Cunard is a luxury British cruise line based at Carnival House in Southampton, owned by Carnival Corporation since 1998. It has been a leading operator of passenger ships on the North Atlantic, celebrating 175 years of operation in 2015. There are three Cunard liners - Queen Mary 2, Queen Elizabeth and Queen Victoria.